The following images are from the Minovici museum, also knonw as Mina Minovici villa, in Baneasa – Herastrau area of Bucharest, which is one of the most iconic Neo-Romanian style edificies, erected in 1905 – ’06 after the plans of architect Cristofi Cerkez, to house the Romanian ethnographic art collection of dr. Nicolae Miovici, the first national art museum in the country. What drew my attention was the amply decorated ceiling of its imposing tower, a rare occurrence for this architectural order. It is clearly inspired from the late medieval Wallachian, also known as Brancovan, church decoration, such as that which I documented at Stavropoleos church. It is a cosmogonic composition, depicting the celestial universe, with its constellations seen in the yellow colour vines and leaves curling intricately around small red buds signifying the diverse worlds and flowers with red stamen and yellow petals signifying the burning asters, where the Sun, the largest flower, is at the centre of the cosmos. The decoration is thus an excellent rendering of the Romanian peasant cosmogonic belief system, expressed in legends and ballads such as the well known Miorita, which I can say with a high degree of expectation that is architecturally rendered in this wonderful painted ceiling. If you plan acquiring or selling a historic property in Romania or start a renovation project, I would be delighted to advice you in sourcing and transacting the property, specialist research, etc. To discuss your particular plan please see my contact details in the Contact page of this weblog. I was quite amused when photographing the juxtaposition between the architectural and natural felines presented in the image above. The cat is doing its late afternoon routine, while the lion at the centre of the Neo-Romanian style panel has a much loftier mission, guarding the paradise, symbolised by the dense vines and leaves in the background, against evil forces, seen in the monster head-only creature that bites one of its hind legs. The above panel is about 1.40m in length and constitutes the fence of a second floor Juliet balcony adorning a mid-1930s house built in a mix of Neo-Romanian and what I call fairy tale castle styles, located in Dorobanti area of Bucharest. I made the photograph during the architectural tour, which I organised there a couple of Sundays ago. The two sectors of the panel display a very expressive and refined Manichean symbolism: the good and evil principles on the left hand side panel and their never-ending and never-decided battle on the other, encircled all along by grapevines representing, in Neo-Romanian imagery, succeeding cicles of the universe. The Manichean myths have ancient roots in the Romanian peasant beliefs, being expressed in ethnographic art, legends and also intensely intermingled with the type of Christian religion practiced by peasants. The Neo-Romanian architecture has adopted the symbolism associated with those beliefs in its represenetations, as I often was able to find such wonderful depictions within panels and architectural elements on Bucharest’s buildings in that style, such are the examples featured here or here. In the case of the panel presented here, its first sector (the right hand side one) contains a lion symbolising the good principle, paired by a fantastic and fearsome winged four legged animal with a “bloodthirsty”-like bird head that symbolises the evil principle. The second sector contains representations of battles between the good and evil: the first battle, from the left, is won by the good forces, where the eagle kills a serpent, while in the second battle representation the evil forces win over the good ones seen in the wolfish animal grabbing and eating a fallen eagle. 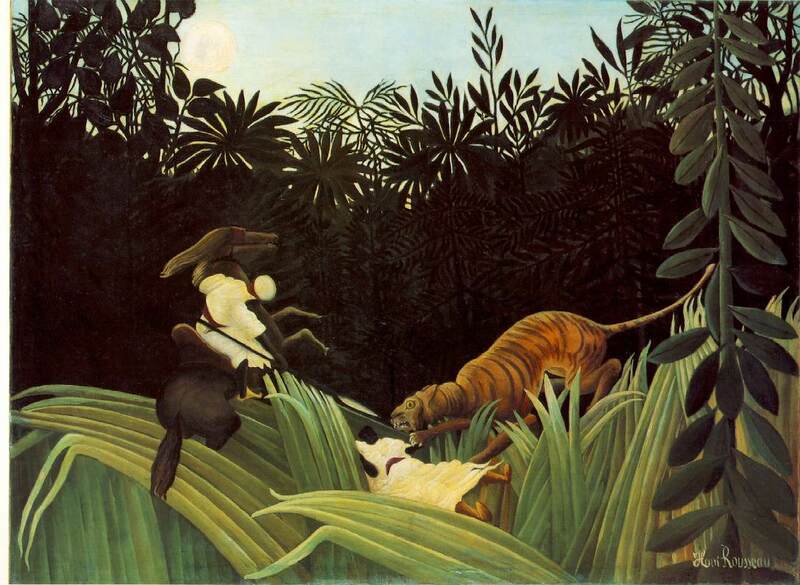 I am impressed by the drama exuded by this last particular scene, rendered in a naive artistic manner, something which very much reminds me of the famous paintings of Douanier Rousseau (Henri Rouseau), the post-impressionist French artist, especially his canvases called The Sleeping Gipsy or Scout Attacked by a Tiger. I included bellow a close up of that scene to highlight that stupefying similarity. 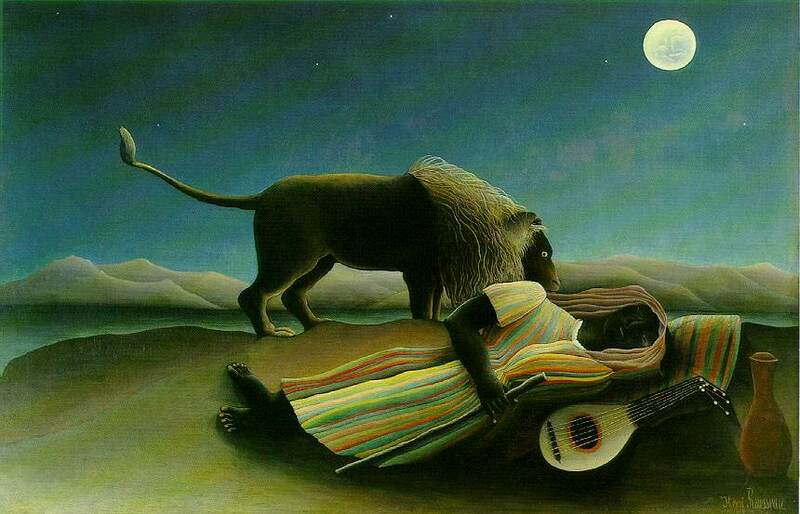 It denotes perhaps a phenomenon of artistic convergence in visual naive arts spanning decades and meridians. The photographs displayed bellow present a sample from among the great multitude of flamboyant decorative panels that embellish many of the Neo-Romanian style houses in Bucharest. The common denominator for this particular selection is the presence of a flower pot at the centre of the panel from which flowers and grapevine plants spring up. The symbolism associated with the flower pot is that of the origin of life, while the luxuriant flowers and the grapevines represent the Garden of Eden. I endeavour through this daily series of articles to inspire appreciation of the historic houses of Romania, a virtually undiscovered, but fascinating chapter of European architectural history and heritage. The Neo-Romanian style decorative panels depict most usually themes from the Romanian peasant mythology or Byzantine church imagery. These are expressed in decorative motifs containing animal and plant symbols inspired from the local flora and fauna found in this area of south east Europe at 45 degree north latitude. Among those representations is the omnipresent grapevine plant associated with the tree of life motif or peacocks and doves that express the beauty and serenity of the Garden of Eden. Other typical representations are those of oak leaves, berries, wolves or even bears and squirrels. The panel above is most unusual and probably unique among the Neo-Romanian style depictions, in the sense that it contains a jungle motif panoply centred on the image of a monkey. That is a portrayal of the Garden of Eden, pointed out by the two gracious peacocks and the two orchids springing up from a flower pot. The sense of abundance is given by the pineapple-like fruit grabbed and eaten by the monkey. I very much like how the monkey sits with its legs on the slender necks of the peacocks. I believe that the primate species in this panel resembles the macaque monkey, a sacred animal in India and the question that renders itself is: who would have decorated his or her house in this corner of the Balkans with symbols inspired and adapted from the remote Indian environment and creeds? That should be a person notably linked trough profession or travels to that country. The house which sports the panel is a hybrid 1930s inter-war Venetian and Art Deco modernist Italian palazzo inspired edifice. That kind of a quite opulent building decorated with this combination of symbols should have belonged to a rich person from the Romanian aristocracy or high bourgeoisie, who would have experienced life threatening events and travelled to those sort of exotic places. The person which springs to my mind and fits somehow the bill is the aviator Prince Valentin Bibescu, who has been one of the first and most famous Romanian pilots, an early graduate of Louis Blériot’s school and who in 1931 undertook a famous long distance airplane ride from Paris to Calcutta. The airplane pilot in that era was in most aspects a dangerous profession and Bibescu, for sure, had his fair share of life threatening experiences, which would explain the Phoenix Bird panel. That air-raid to Calcutta would on the other hand explain the Indian flora and fauna inspired panel in a Neo-Romanian guise on that house. Of course that is only a supposition, which has to be further verified and documented, but nevertheless is a starting point of a very intriguing quest. I am looking forward to hearing suggestions from my readers, which would unravel the mistery of that fascinating panel! I endeavor through this daily series of daily articles to inspire appreciation of the historic houses of Romania, a virtually undiscovered, but fascinating chapter of European architectural history and heritage. If you plan acquiring a historic property in Romania or start a renovation project, I would be delighted to advice you in sourcing the property, specialist research, planning permissions, restoration project management, etc. To discuss your particular plan please see my contact details in the Contactpage of this weblog. A conspicuous feature of the Neo-Romanian architectural style is represented by the elaborate decorative panels that emphasize areas of the façade or stairway. They contain a wealth of designs centred on a number of motifs inspired from the late medieval Wallachian church decorative panoply such as that of peacocks in the Garden of Eden, protector eagle or lions guarding the gates of Paradise. There are also instances of decorative panels containing non-religious abstract motifs in a variety of designs. Bellow are a few examples from the wealth of such attractive architectural artefacts embellishing Neo-Romanian style houses in Bucharest and Targoviste in southern Romania. The panel above is a representation of the protector eagle, guarding the Garden of Eden, engaged in a manichean battle with a serpent, the embodiment of evil. The Garden of Eden is envisaged as a luxuriant grape vine full of fruit, with its vines contorted around the eagle in the shape of a Greek cross, an allusion that the supreme deity watches that never ending fight. The panel from the second photograph is rendered in a more schematic, crisp manner, an indication of the Art Deco influence over the Neo-Romanian style that started to manifest in the early 1930s. The image above shows an imaginative decorative use of a loft air vent, rendered in the shape of an abstract Greek cross, covered by a rectangular ironwork pattern containing smaller crosses of that type. This forth decorative panel contains a floral motif that does not have immediate religious references, rendered in an Art Deco manner, a result of the high influence of that style on the Romanian architectural scene in the 1930s. If you plan acquiring a historic property in Romania or start a renovation project, I would be delighted to advice you in sourcing the property, specialist research, planning permissions, restoration project management, etc. To discuss your particular plan please see my contact details in the Contact page of this weblog. The Neo-Romanian decorative panel in the photograph above consists of vine branches and leaves, having at its centre the coat of arms of the Oltenia province, a historical region similar in size with Wales, located in south western Romania. The owner of the house wanted probably to state through this representation his origins or connections with this old Romanian province. The heraldic sign comprises of a shield on which is depicted a crowned lion raising up from a ban crown. A ban is an old medieval Hungarian term for regional governor, dating from the times when Oltenia was a Hungarian province, over five centuries ago. The lion also holds between its forelegs a six pointed star. I like how this heraldic sign gives excellent clues about the year when the house was built. It is a version of the coat of arms in use between 1872 and 1921. On the other hand, the panel and the whole house façade is made from moulded concrete, a material which started to be used on a larger scale in Romania after the end of the Great War. Moreover, the typology of the stylised vine branches is also characteristic for the early 1920s. All of these features lead me to the view that the house, or at least this particular house section, has been built sometime between 1919 and 1921. Of course that has to be confirmed with archive documents, but through experience and observation I am by and large positive that I am somewhere close to the construction date stated in deeds. The date thus evaluated helps me better understand in situ the architectural history context of that house, the materials and technologies used and formulate an initial guidance to the house owner regarding the restoration/ renovation of his/her period property or its market value range. This is an extremely elegant, in my opinion, Neo-Romanian style panel depicting the biblical Garden of Eden, centred around the protector eagle fighting the evil serpents, surrounded by the lush branches and fruit of the tree of abundance (a grapevine plant in this instance), motifs inspired from the late medieval Wallachian church decorative panoply. The panel is quite large- about 1 x 1.4m, sitting on the side façade of a grand Neo-Romanian style building in the Buzesti area of Bucharest. I endeavor through this daily series of daily articles to inspire appreciation of the historic houses of Romania, a virtually undiscovered, but fascinating chapter of European architectural heritage. This decorative panel embellishes the street wall of a Bucharest mid-1930s Neo-Romanian style house. It contains the representations of the tree of life and the Garden of Eden, both symbolised by grape vine plants, inspired from the decorative panoply of the late medieval Wallachian church architecture. The three of life springs up from the base of the panel in waves of leaves symbolising cycles and pivotal moments in life, while on the Garden of Eden sector contains a grape fruit symbolising abundance surrounded by vine leaves that serenely fill the space in all directions. The pairs of peacocks on both panel sectors are representations of peace and harmony and an allusion to the couple that built and made that house their home. I very much like the simple rectangular geometry of the panel sectors and the highly abstract symbols contained within them, which together with the style of the letter rendering of “Vila Maria”, the name of the house, point toward influences from the Art Deco and Modernist styles, very much in vogue in the Bucharest of that period.